Last night I had a colleague Chris Willems come along to my class to run a workshop on talking to camera. In these workshops, Chris does an exercise where he gets students to stand up in front of an iPhone and talk to camera on a random topic that he gives you immediately before counting you in to start recording. This workshop is a lot of fun, but it is tricky to make it engaging for the online students who are at home listening in via Collaborate. (Note: We bring online students ‘into’ our on campus classroom using Collaborate.) They can’t see what’s happening when the students in class do the activity. We have problems using video in Collaborate because it chews up a lot of bandwidth – to the point where I just tend not to use it at all because it messes with the quality of the audio. So, seeing students would be talking to a phone camera anyway, I thought we’d have a go at broadcasting the activity via Periscope for our online students to watch live. 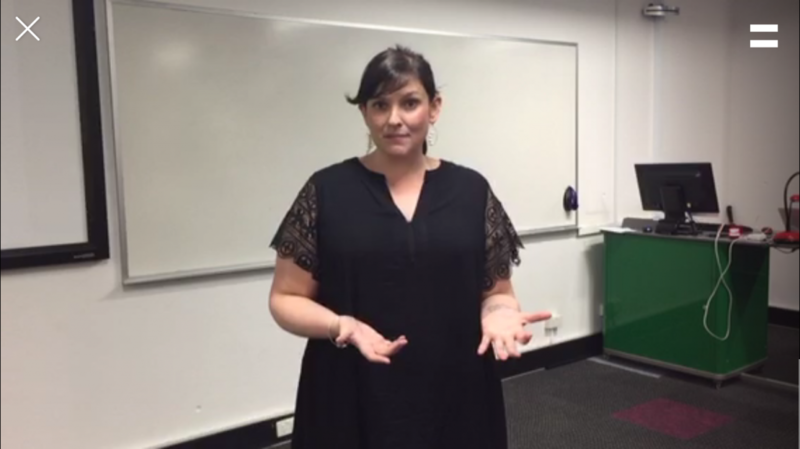 Here I am having a go at the talking to camera activity – screenshot from the Periscope replay. It worked beautifully and the online students loved it. Not only could they see us, but the audio quality was significantly better than Collaborate (not hard to beat that though really!). I’ve been watching the replay back this morning and I’m amazed that the microphone on my iPhone picked me up when I was at least five metres away from it. We just don’t get that in Collaborate using the lapel mics we have in the classroom. As a result, any discussion that happens in the on campus classroom becomes fragmented and unintelligible for the online students. I didn’t realise I could set Periscope to automatically save videos to my camera roll (I tend to jump in the deep end and try stuff out without reading the instructions. Sometimes this gets me into trouble, but more often than not it works out okay). When I got home last night and investigated, I realised I could have saved the recordings to my phone at the end of the broadcast, as the video was being uploaded for replay, but I don’t think you can do it after that (or at least I haven’t been able to figure out how). Verdict? We loved it. The online students were really happy with the quality so we kept it running for the rest of class. I turned the broadcast off while we were all working on an independent activity, and the online students asked me to start it again afterwards. What’s missing? Conversation. Obviously if my phone is on a tripod capturing me talking, I’m not going to be able to engage with the students at home via Periscope. Viewers can heart the broadcast at various stages and they can write messages in the chat (both of which appear on the replay – nice! ), but we can’t have a text based conversation. What we didn’t love? Students without iDevices couldn’t join us (Periscope is currently iOS only). Will I use it again? Yup, definitely. It’s not a replacement for Collaborate because of the limitations (no conversation and iOS only), but I think it’s an easy thing to run in addition to Collaborate. It will improve the online experience for students who attend live classes via our virtual classroom tools with virtually no extra effort, and that is a very good thing. PS. I’m @katiedavis on Periscope.